Breaking News: Americans love them some 2012 Summer Olympics. Although the four featured fights in Saturday’s live “UFC on FOX: Shogun vs. Vera” broadcast hosted a spectacular show, the Octagon’s fourth foray on FOX garnered just 2.4 million viewers. According to TVByTheNumbers, 28 million fans flipped the dial to catch NBC’s tape-delayed Olympics when FOX peaked during the 9:30PM ET/6:30PM PT time slot. May’s “UFC on FOX: Diaz vs Miller” event averaged the same 2.4 million viewers for FOX. The organization’s second primetime television card, January’s “UFC on FOX: Evans vs. Davis” event, featured three bouts and averaged 4.7 million fans. The UFC’s debut on FOX only aired one contest, but garnered an average of 5.7 million viewers. The November event peaked at 8.8 million during the 64-second shootout between Cain Velasquez and Junior dos Santos. This past Saturday’s festivities featured a pair of light heavyweight top contender bouts. 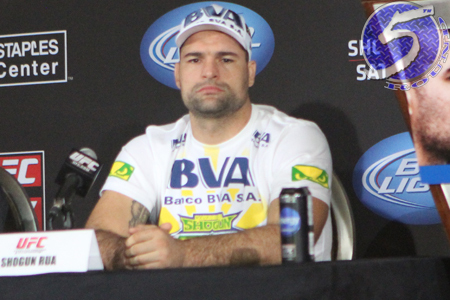 Mauricio “Shogun” Rua (Pictured) battled Brandon Vera in the night’s featured attraction, while Lyoto Machida met Ryan Bader in the co-main event. Whoever posted the most impressive victory earned next dibs at the 205-pound crown. UFC president Dana White ultimately decided Machida’s 2ndRound knockout trumped Shogun’s 4thRound TKO win.